During these events—and perhaps inspired by them—Graham began writing articles for The Magazine of Wall Street, putting to paper his earliest ideas on value investing and security analysis. Benjamin Graham was the author of many influential investment books, including the classic Security Analysis, now in its sixth edition. 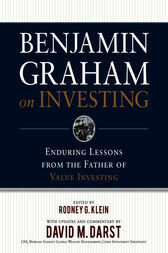 The first proponent of the value school of investing and founder and former president of the Graham-Newman corporation investment fund, Graham taught at Columbia University’s Graduate School of Business from 1927 through 1957. Rodney G. Klein is a Wall Street historian and former student of Benjamin Graham at UCLA. He founded the Klein Stock Market Museum & Library in Massillon, Ohio. David M. Darst, CFA, is a managing director of Morgan Stanley. He serves as Chairman of the Asset Allocation Committee and Chief Investment Strategist of the Global Wealth Management Group. Darst was the founding president of the Morgan Stanley Investment Group.